Batik is an Indonesian word meaning writing with wax. Waxed areas create a resist design that dyes and paint cannot penetrate. Traditional batik techniques involve successive applications of wax and dye, submerging the fabric in a dye vat one color at a time and layering the wax resist. In this class we use a more modern technique of painting diluted acrylic paints instead of dyes. This allows the artist to use a variety of colors next to each other without the colors mixing with the previous color layer. The tjanting is a traditional tool with a little spout used to apply lines of wax; the tjap is a copper stamp that can be dipped in hot wax to create multiple design areas. Traditional tools and brushes were used to apply hot soy wax resist to the fabric. Soy wax is environmentally friendly and washes out with hot water. Gel glue was also employed as a resist. 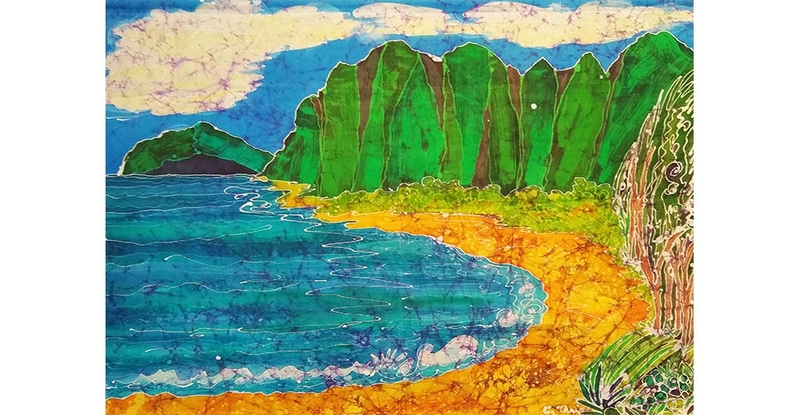 The batik class is usually offered in the fall semester at the Honolulu Museum of Art School. Contact etrain@honoluluacademy.org for info.